To so many of us, horses symbolize freedom, majesty, power, grace, courage, fearlessness, obedience, and strength. Their faithfulness and loyalty have made humans trust their abilities and friendship for thousands of years. To capture this in a painting is a daunting task to say the least. In this painting, the wind and waves beat against them. These three majestic horses gallop “Against the Wind.” Not for once doubting their own strength, they leap and trod all over any obstacles that appear before them. Their freedom and power is gained by their complete lack of fear. In the book of Job, the Bible says, “You give the horse its strength or clothe its neck with a flowing mane. You make it leap like a locust, striking terror with its proud snorting. It paws fiercely, rejoicing in its strength, and charges into the fray. It laughs at fear, afraid of nothing; it does not shy away from the sword. The quiver rattles against its side, along with the flashing spear and lance. In frenzied excitement it eats up the ground; it cannot stand still when the trumpet sounds. At the blast of the trumpet it snorts, ‘Aha!’ It catches the scent of battle from afar, the shout of commanders and the battle cry.” I hope this painting inspires you with its message. Pursue what God has placed in your heart. Face challenges with no fear. Run with endurance the race set before you. Gallop with all of your might “Against The Wind.”To so many of us, horses symbolize freedom, majesty, power, grace, courage, fearlessness, obedience, and strength. Their faithfulness and loyalty have made humans trust their abilities and friendship for thousands of years. To capture this in a painting is a daunting task to say the least. In this painting, the wind and waves beat against them. These three majestic horses gallop “Against the Wind.” Not for once doubting their own strength, they leap and trod all over any obstacles that appear before them. Their freedom and power is gained by their complete lack of fear. A father lion holds his little cub close as they survey their domain from high on a grassy hill. The father has been training his son all day to be a strong alpha lion like him, and now they’re enjoying a warm moment to reflect. Our Heavenly Father is training us daily to be like him. Through study and practice of the Father, we grow, and we emulate His character and attributes with time. As we grow in His image, we become the powerful lions that God wants us to be as we face life’s tests and challenges. 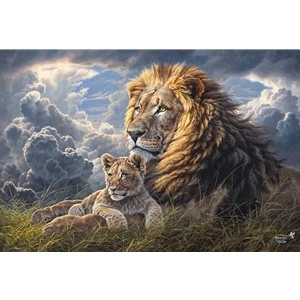 When you see this painting, just imagine yourself as the cub in his father’s arms staying close under the shadow of the Almighty. No matter what dark storms may brew in the distance, nothing can touch us when we stay in His arms. I hope this painting blesses you!